Tuckerman Ravine is an expert skier’s rite of passage to be in the elite league of core Easterners. There is nothing easy about Tuck’s, it is hiking, mountaineering and steep skiing. But to ski Tuckerman is also a decades old downhill tradition, often the last chance to ski in May after New England ski resorts have closed, and Tuckerman Ravine is a big party on snow on 6,288’ Mount Washington. Every spring, 500-4,000 skiers and snowboarders a day will flock to Tuckerman Ravine, a spectacular glacial bowl on the eastern face of Mt. Washington, for arguably the steepest backcountry terrain in the country. 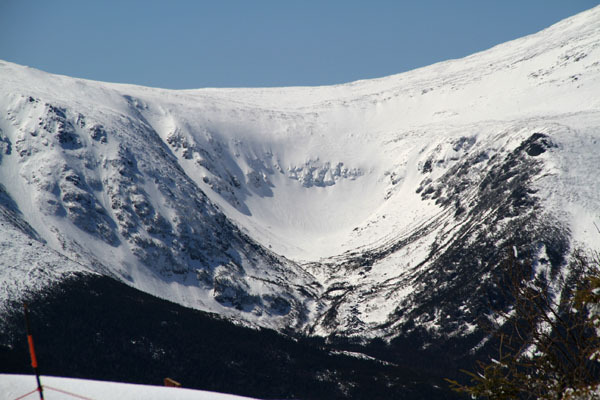 Tuckerman Ravine typically receives up to 26 feet of snow (the record snow was 566”/47-feet in 1969). The more snow, the better the skiing, but skiers should be sure to aware of the avalanche risk by checking the snow stability (see the link below for reports). Big snow can be unstable and result in slides in this natural terrain. March 29, 2014, a large avalanche swept 650 feet across and continued 385 vertical on the Southeast section of Mt Washington – called the snowfields. This slide set a record, no skiers were hurt fortunately of the 20 skiers out on the slopes that day. 2014 has brought much snow to Mt Washington, a 20 foot snow pack still exists in April. Every year is different, in 2011 Tuckerman only received 174″ or 14 feet of snow, half the average and by mid March the Sherburne Trail to the base was not skiable all the way down – which typically lasts through April. Families should also be advised, Tuckerman Ravine is a serious three-mile hike up the Tuckerman Ravine Trail from Pinkham Notch Visitor Center, carrying your ski gear, strapped to your backpack, to a high alpine bowl where conditions are ever-changing, and the skiing is on a 35-60 degree sustained pitch depending upon whether you ski the Bowl, or Hillman’s Highway, the Left Gulley or the Right Lobster Claw. Tuckerman Ravine warrants respect and preparation before you just pack up your picnic, your skis and go. Weather on Mount Washington changes fast and the skiing is variable with crevasses, rime snow and ice, much of it no fall terrain. This is not a ski resort with groomed surfaces, ski lifts, base lodges, food service, fancy hotels, shops – you get the picture. You pack in and you pack out – ski gear, supplies, food, water, first aid, layers of clothing for sunny spring skiing to howling wind, sleet, snow and rain – you can experience all of these harsh elements within hours on Mount Washington. On a beautiful April Saturday in Tuckerman’s, it is a crazy spring ski party (sights not always appropriate for children) on the Lunch Rocks, but the risk of falling and sliding on the steep ski terrain is always a big risk. Tuckerman’s has volunteer ski patrols, but Mt Washington search and rescue efforts can be at the expense of the endangered or injured person, so don’t be ill-prepared. If you are going to do Tuck’s, check the weather and the Tuckerman Avalanche and Ski Reports, pack accordingly, be prepared for a long hike in and out, and seriously steep skiing. Tuckerman Ravine continues to lure serious downhill skiers, as it has since the 1930’s, the first top to bottom race, The Inferno, was held in 1933. The most famous Tuckerman skier was Toni Matt, who in the 1939 Inferno Race skied from over the Headwall making about three big turns, then raced all the way down the Sherburne Trail in 6.29-minutes (don’t try this). The Tuckerman Inferno Race continues to this day but now it is a Pentathlon organized by the Friends of Tuckerman including kayaking the Saco River, biking, running and skiing Tucks. You can set up camp at the AMC Hermit Lake Shelters at the base of Tuckerman Ravine or stay at the trailhead base at Pinkham Notch AMC Joe Dodge Lodge – ask for the Tucks bunk and breakfast special, so you will be ready to climb and ski bright and early. Or if the lifts are running across Pinkham Notch at Wildcat, ride the 6 minute quad and enjoy spring skiing without hiking!